Obstetrics litigation often boils down to a question of what events occurred within the uterus during development or during the birthing process. Often, if we are to understand what happened to the fetus at a crucial moment in the pregnancy, we need to have a clear understanding of how that fetus is positioned within the uterus or the birth canal. For this reason, issues of fetal lie, presentation, position or station are eventually discussed in almost all obstetrics cases. Therefore, I will try to provide you with a basic understanding of these concepts so that you can better visualize the wide variety of ways that the baby can be positioned within the mother. First of all we have to establish our terms. For the purposes of this conversation, I’d like for you to visualize the mother in a standing position so that “down” is toward her feet and “up” is toward her head. “Posterior” is toward her back and “anterior” is toward her front. Right will always mean her right regardless of how the baby is positioned or how you are standing. Just remember that when I use directional terms, it’s all about the mother. Keep in mind that it is of paramount importance to know the orientation of the fetus within the uterus, particularly at the onset of labor. Orientations that are not ideal may require intervention and, in some situations, cesarean delivery may be the only viable option. During labor, an appreciation of the fetal station within the birth canal can help us to judge how the labor is progressing and which delivery techniques may be warranted at a given time. Traditionally, the orientation of the fetus is described with respect to its lie, presentation and position. I will provide an overview of these terms. The lie of the fetus can be either longitudinal or transverse. In other words, the long axis of the fetus can either be parallel or perpendicular to the long axis of the mother. Luckily, the fetal lie is longitudinal in about 99% of cases. This is a good thing since a transverse lie cannot allow for the proper vaginal delivery of the fetus. Once we know the lie, we can determine the presentation. The presentation can be either cephalic or breech, which means that the fetus can be either “head-down” or not. There are a number of different types of cephalic presentation, but the most common is called vertex presentation which refers to the fetus entering the birth canal head first with the upper occipital (back) portion of the head leading the way. Next, the position of the fetus can be established. Position refers to the relation of the occiput (back of the skull) of the fetus to the left, right, front and back of the mother. In other words, if we know that the back of the fetal head is facing the front of the mother, this is called the occiput anterior (OA) position and if the occiput is facing the right side of the mother, this is called the right occiput transverse (ROT) position. Any combination of these, where the occiput of the fetus is toward the right and toward the front in a diagonal fashion, is called the right occiput anterior (ROA) position. 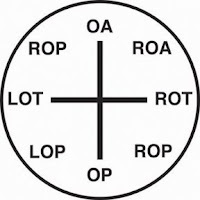 This convention allows us to note any one of the following eight positions: occiput anterior (OA), right occiput anterior (ROA), right occiput transverse (ROT), occiput posterior (OP), left occiput posterior (LOP), left occiput transverse (LOT), and left occiput anterior (LOA). Finally, we can discuss fetal station. The fetal station is a measurement of how far the fetus has progressed down through the birth canal during delivery. This measurement reflects the relationship of the leading edge of the fetus, generally the top of the head, to the ischial spines of the mother’s pelvis that are halfway between the pelvic inlet and pelvic outlet. When the leading edge of the fetus reaches the ischial spines, this is called zero (0) station. In the currently used “fifths” system the space is divided above and below 0 station in one centimeter increments, so that the space above the ischial spines is designated from -5 station to 0 station and the space below the ischial spines is designated from 0 station down to +5 station. With each centimeter that the leading edge of the fetus progresses, you reach a new station of presentation (-5, -4, -3, -2, -1, 0, +1, +2, +3, +4, +5). You should be aware that a previously widespread system, the “thirds” system, divided the space above and below the ischial spines into arbitrary thirds so that the stations progressed from -3 to +3 without regard to actual centimeter measurements. This is important because only 0 station coincides in these two systems and you can get an inaccurate picture of the case facts if the correct system is not used. To complicate matters, many doctors and hospitals still refer to the old system so it is best to establish early which system is being used in the records of any particular case. These are the key terms that you will encounter when researching almost any case involving birth injuries or obstetrics mal practice. Hopefully this overview has given you a better understanding of the varieties of fetal orientation and will help you to better visualize the lie, presentation and position of the fetus within the womb. awesome! !.........Ben, thank you soo much for forwarding me this information and for keeping me on your mailing list! I always get excited when I see your name in my inbox because I know that means I will learn something new....or,.....that the message will confirm what I already know!! I will inform you of any new topics I would like to see you cover, however you seem to always be a step ahead!!! You go, guy!!! Please keep up the good work.......and PLEASE keep the e-mails coming! !